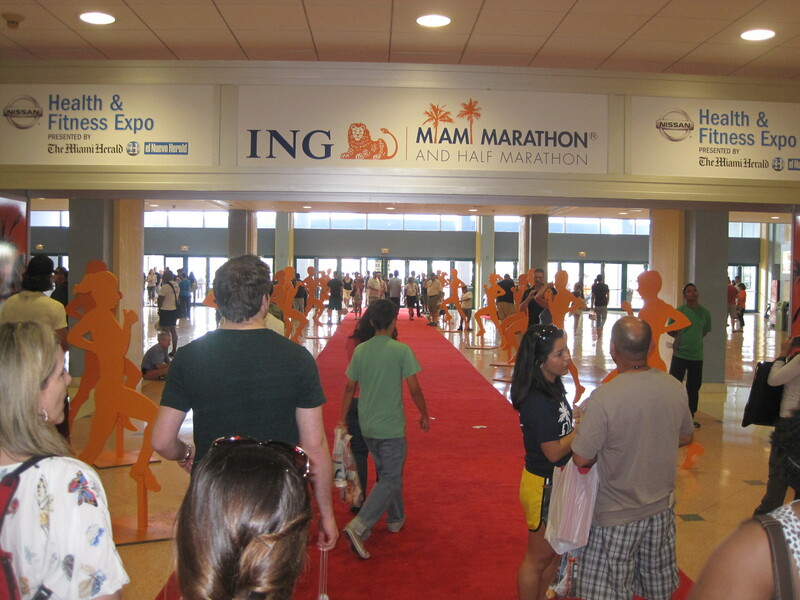 I signed up for the 2012 ING Miami Half Marathon two days after running the 2011 race. They got me with their registration blitz, where prices are ludicrously low for the first 500 registrants. 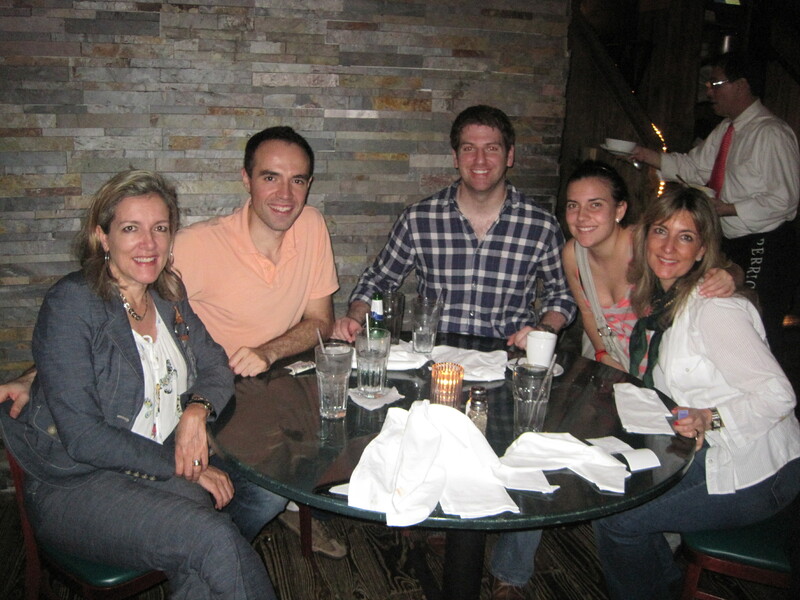 Plus, my cousin Paula and I had decided to make it into a little annual family tradition. So it’s been on my calendar for an entire year, and the threepeat had finally come. Would it be uncommonly cool? Perhaps we’d get a repeat of 2010’s oppressive humidity? Maybe it would finally rain? With these uncertainties in my mind, I flew down to meet up with my mom, my aunt, cousin, and running compatriot Otter, whose medal addiction had drawn him to sunny Miami for the race’s famous spinning palm. We were in the starting chute just minutes before race start. We had gotten emails telling us that security would be “tight” in the corrals, but that turned out to be mostly hot air. It seems no race can truly solve the problem of runners not sorting themselves correctly during the start. There are never just one or two people who settle themselves into the first corrals and walk the race. But this race, for some reason, elevates this discrepancy to an art form. No matter where you are sorted, you’ll end up weaving sideways for the first two miles, dodging fast runners and skipping past walkers. The first mile, as usual, is mostly uphill as runners tackle the MacArthur Bridge. As I climbed upward, I felt a bit concerned. The humidity wasn’t as punishing as it was two years ago, but it certainly wasn’t as deliciously crisp as it was in 2011. Since I was expecting a slow first mile, I wasn’t surprised when I clocked an 8:27. I was somewhat relieved when I felt a heavenly breeze cutting across the top of the crest. 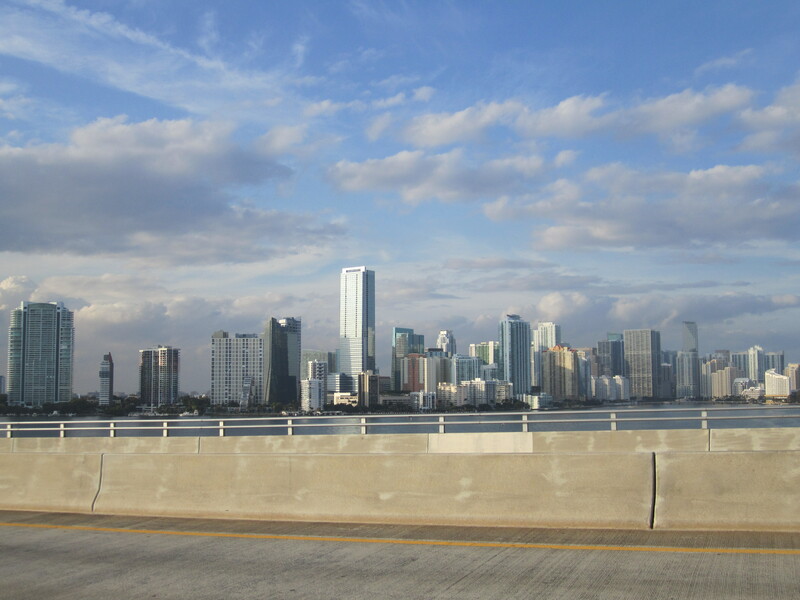 It would accompany us for the rest of the eastward run toward Miami Beach, with palm trees to our left, enormous city-ships anchored on the right. The morning sun had yet to make its appearance, but dim shades of blue were emerging from a distant cluster of baleful rainclouds. As I ran down the causeway, I was a bit nervous. I was definitely sweating more than usual and I could feel the heaviness of the air as I slipped through it. It didn’t help that my second mile was an 8:08. I thought I had perfected the art of running a particular pace without the aid of a watch, but Miami’s conditions had thrown off my talent. I thought I was running a 7:40, not an 8:08. It’s rarely comforting when your perceived exertion is much higher than your actual output. It instantly puts doubts in your mind and the psychosomatic effects can compound. In spite of that moment of frustration, I still felt motivated to pick up the pace. Once I reached the first water station around mile 3, I logged a validating 7:32 split. 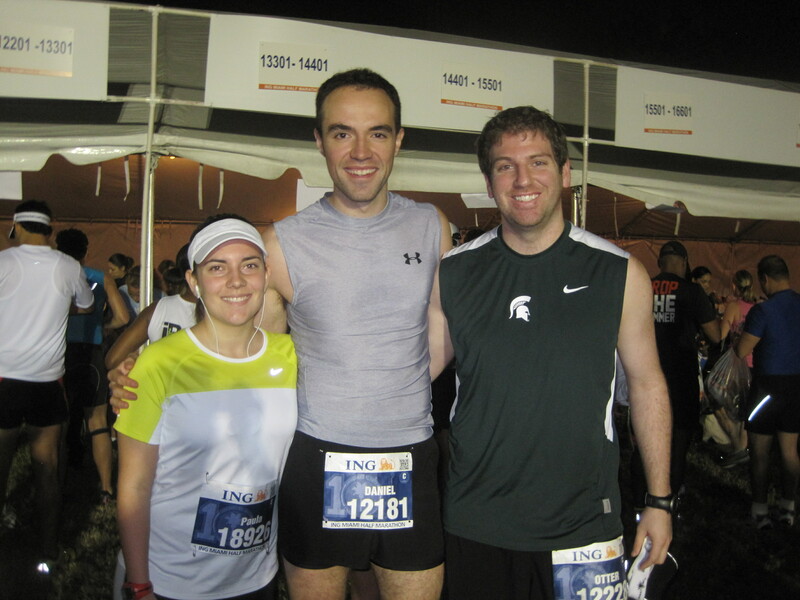 But I was almost completely drenched in sweat, which is not a good sign so early in the race. At that point, I knew I had to make a choice. Do I scale it back and run more slowly to avoid an ugly finish, or be an idiot and keep running like this until I blow up? I knew what could happen when the humidity climbs and hubris takes over. But the soaking wet shirt aside, I felt great. Should I abandon all conservatism and just go hard to test my limits, or play it safe and just enjoy the race? The next two splits would answer these questions. Despite water stations being too crowded and chaotic, I blazed through South Beach. It definitely helped that I started singing Yellowcard’s “Ocean Avenue” along Ocean Drive. I remembered, with little fondness, the first time I ran down this particular section of the race. As iconic and beautiful as it is, I couldn’t enjoy it because I was already heaving and struggling to move forward. But even my daring confidence wasn’t enough to keep my pace consistent after I saw that 6:56 split. I made a conscious decision then to slow down a bit because no amount of determination would keep that suicidal pace for another seven miles. And so the game was on. In most races, there is always a tacit fear of bonking, but you don’t entertain it until it’s inevitable. This time, I was almost embracing the bonk, expecting it to show its dreadful face. I therefore had to put in enough punishment early on to give myself a cushion at the end. Ask any long distance runner and they will tell you that is a terrible idea. Negative splits are the building blocks of a successful race strategy, not going hard at the beginning. But there was a stranger running in my stead today, and he didn’t care. The new mantra was, Can I run another mile at this pace? Just one more mile? Alright, I thought. I can still do this for awhile. I was having to brush sweat off my eyebrows more often than I would like, but I somehow kept up the pace. Water stations were no longer as messy as the first three were, mostly because the pack had thinned considerably. Now that the race had ballooned to over 20,000 runners, it was imperative that the organization improve their early water stations. Since the course is a circuit, runners are usually making left turns, so they’re mostly on the left side of the street. However, the first two water stations were on the right side. It’s therefore expected that everyone will dash right, get water, and then dash back left. This could be solved by adding an extra water station on the left side, which is common in most races of this size. But once on the Venetian Causeway, this was no longer an issue. With the ocean on both sides of us, there was little obstructing the wind’s path. That perfect breeze that cooled us down at the top of MacArthur was back, keeping me moving at a consistent pace without overheating. I kept asking myself: is this the mile where it all falls apart? Is this the beginning of that slow, painful crawl? Is this where everyone else starts patting me on the back and saying “You can do this, buddy” or “Hang in there”? Though mile 10 was showing signs of decline, I still kept my head up. I kept wondering, Am I really doing this? Am I winning this game of chicken between me and the elements? Since the last three miles are always the toughest, I couldn’t yet declare a victory. 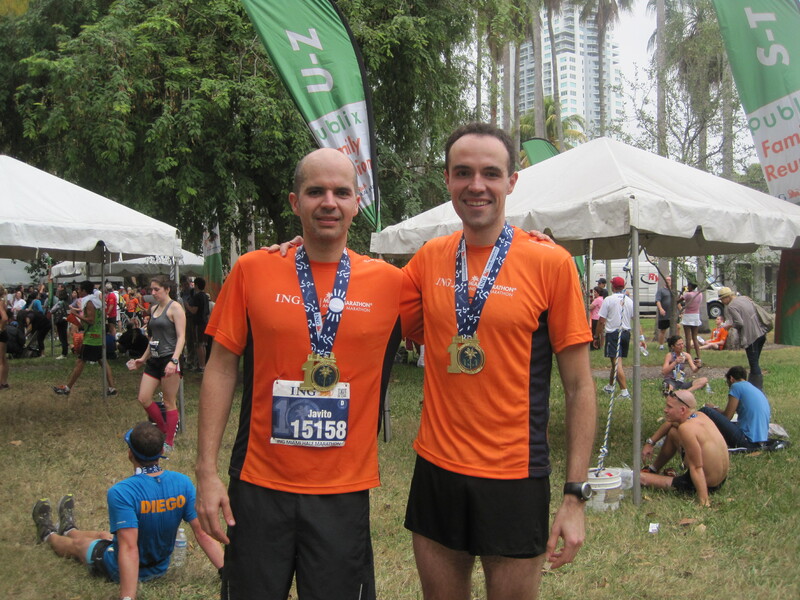 But still, the thought that I could somehow finish under 1:40 in Miami was tantalizing. I always discard fast times in warm temperatures because I believe I sweat more than the average person. Over distance, the heat drains me of energy, which is why I high five Mother Nature when the mercury dips below 50 on race day. But today it was almost 70, with the dew point around 68 degrees. I was back in the game. This was actually happening. And once the course enters the mainland and passes the ING Cheer Zone, we’re almost at the finish line. 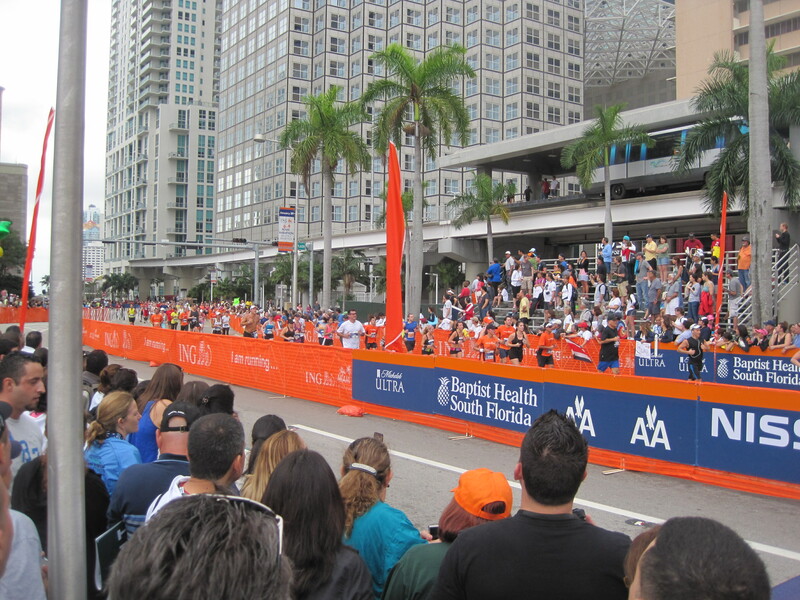 The last two miles cut through downtown Miami before turning back north into the finishing chutes. Even last year, where the race was blessed with cool conditions, I started losing energy here. But today I was unstoppable. Even though I felt like I was leaving puddles with every footstep, I kept pounding the pavement to the tune of a 7:14 mile. A sub 1:40 time was possible and I would have thrown my arms in the air triumphantly at this point were it not for one technical detail. Most of the time, this statement isn’t true. Unless you’re running in a small community race that doesn’t attract a sizable crowd and has lax standards for event production, you’re most likely running a standard distance course. Races are measured very meticulously to meet USATF rules. They wouldn’t just ballpark 13.1 miles and expect everyone to round down, especially not one with over 20,000 runners, a decent international elite field and considerable prize money. Additionally, Garmins aren’t exactingly precise. Although I love my Forerunner and am a slave to it, if I run near a building over four stories, it will interfere with satellites and alter my stats ever so slightly. It’s meant to give you a pretty accurate picture of your pace and distance, but the numbers on it shouldn’t be read as gospel. So while it may say “13.18” or “26.42,” unless you consistently ran on the outside of the course or zigzagged the entire way, you didn’t run that much extra. But I will temporarily forget this pet peeve and hypocritically declare that the last 1/10 of a mile of this race was unequivocally NOT 1/10 of a mile. I’ve run this race three times now and every single time, the distance between that thirteenth mile marker and the finish is considerably more than the required 0.1 miles left to finish a half marathon. I typically run that last stretch in between 30 and 50 seconds, depending on how much snarl I have left in my game face. So is it merely coincidental that I’ve run this race’s last dash in over 80 seconds all three times? 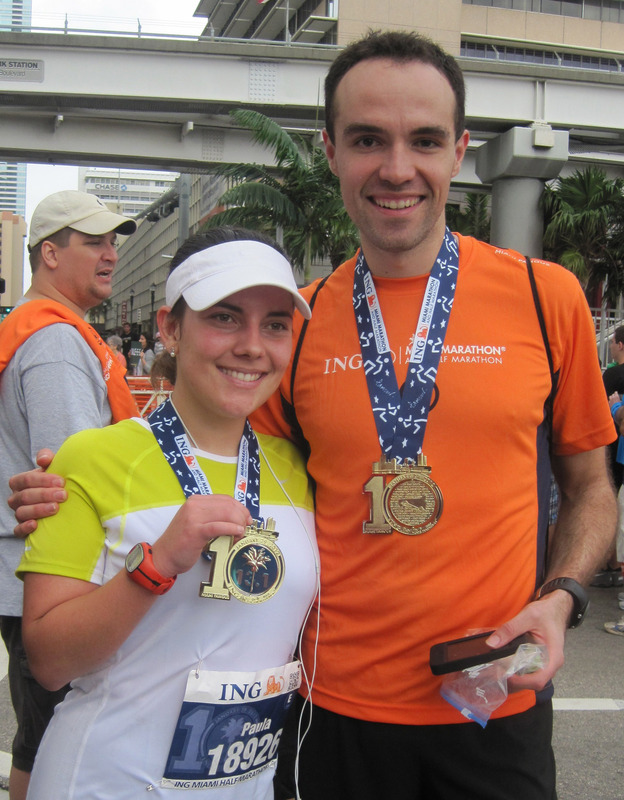 And that, my friends, is why I did not conquer the 2012 ING Miami Half Marathon in less than 1:40, but instead, settled for 1:40:26. But truthfully, I don’t care in the least. Though I did feel a tiny bit of disappointment as I saw the clock creep past 1:40, it was fleeting and instantly forgotten (that is, until this recap). I had managed to throw down what was for me a fast performance in the face of questionable conditions and proudly earned the commemorative 10th anniversary spinning palm medal. 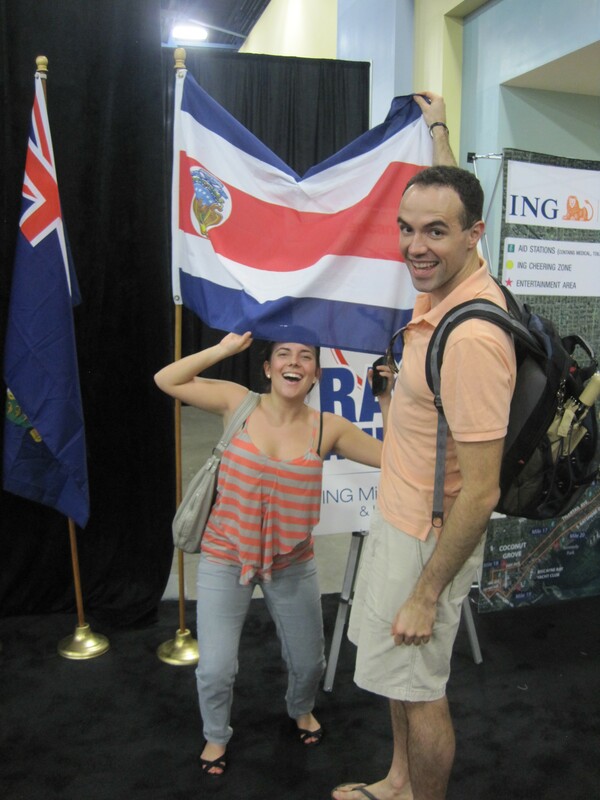 My cousin Paula, whose training was left by the wayside to make room for business school applications, finished her third Miami Half Marathon in 2:15 (and also got into an MBA program, so she was doubly successful). Finally, Otter’s story for this race is one so steeped in disaster that I will not ruin it by telling it myself. Though I doubt even he will sit down to relate it, as it seems that he’s almost abandoned his own racing blog. With this race done, I am ramping up my distance in preparation for the Little Rock Marathon on March 4 and the blister I developed on my right foot during Miami will certainly do its best to stop me. Congratulations! Two more weeks and we’ll be running a chilly, flat race that should give you a great time. As for the extra distance conundrum, USATF rules stipulate that a course be measured by the shortest possible path. Doing this by yourself is possible, but with 20,000 runners you’re constantly weaving from side to side, taking wide corners, etc. and add on the extra distance. Congrats again, and stay healthy. Thanks dude. I know that you’re supposed to “run the tangents” to ensure the fastest possible route, which is what organizers measure. But I hit splits individually at each mile marker, and they were very accurate up until that last stretch. Anyway, who cares, right. Looking forward to some Mercedes action. You are a rock star to be able to run such amazing splits in such warm and crowded conditions. As for the distance, I had a running first–my Garmin 205 and the race clock show the same elapsed time, and you know that almost never happens. The distance, of course, is another matter altogether; according to Garmie I ran 13.29, but I’m okay with that. Considering how many walkers, picture-takers, and random people I had to walk around, I’m actually surprised I didn’t run an extra mile. Congrats on your Miami fame, and good luck in Little Rock. I’ll be looking for that race report! Congrats on that soggy yet fulfilling finish! Maybe they should change the official distance to the 13.1ish miles. Haha! Good luck at Little Rock! Man. You went from one extreme to another. Should prepare you well for the constant-changing weather we have here in Kentucky.